This is the 100th post in this blog about the Atlantic, Pacific and Great Lakes coasts. The number “100” should inspire eloquence and insight. Instead, it caused writer’s block. Then on a trip to the Catskills, I realized that food, culture and fishing are happening along the shores of our oceans and Great Lakes - - regardless of whether or not I was writing. So, I started writing and here is the latest. This post was partly delayed by the preparation for my retirement from the New York State Department of Transportation in late January, 2018, after nearly 40 years of service. My career in State government had ups and downs. But since 2003, I worked in the Office of Transportation Maintenance and that was one of the best jobs anyone could have. In working with environmental stewardship, vegetation management and rest areas, I had the honor of working with some of the best professionals in the nation in these fields. Many assignments led to friendships and we have stayed in contact ever since. Thanks to all for the great success, learning and fun of work the last few years! After retiring, I spent much time, trying to reduce the clutter at home. Here’s my desk after hours of hacking away at the clutter and papers. Since I took this photo, it’s a mess again. But I will keep trying for neatness. My wife Dorothy and I started trout season at the Capital District Fly Fisher’s excellent casting clinic. Friends at the Pasadena Casting Club also provided lots of help. But then, leaky waders and severe allergies kept me off the water. The fishless streak ended in June, when my friend Joe took me, Mark, Carl and Mike on a Lake George fishing trip. We caught bass, rock bass and pan fish steadily throughout the day. Near a Lake George island, there were so many small bass rising to eat surface insects that it looked as if it was raining. For my retirement, co-workers got me a gift certificate from the Beaverkill Angler in Roscoe, New York - - in the heart of Catskill trout fishing. When Pete and I fished the Battenkill in April, a wader leg filledwith cold water. After two patching attempts, I decided to use the gift certificate to buy waders. Carl discovered the Beaverkill Angler, said it was a neat place and he was right! At the store, Evan and Oleh used their selection of rental waders to help me find the right fit. The final choice were Orvis Encounter boot foot waders, with felt bottoms. These were more expensive than the last pair of boot foot waders bought 25 years ago but they have safe, useful features such as a built-in belt to keep the waders from flooding and front pockets to keep the hands warm. As with clothes, stated and actual sizes can be different. Having help and service was important to make sure these waders will be comfortable and functional during long days on the water. The Monday that I bought the waders was hot and muggy. But fished my favorite Catskill stream, the Willowemoc, anyway. On the Willowemoc, I caught my first Catskill trout and my largest trout ever - - a 17-inch brown trout that took a large Hare’s Ear nymph one St. Patrick’s Day afternoon. At 3 PM, the stream was amazingly cool, cooler than similar-sized streams were in June. And . . . fish were rising all over! Oleh said Blue-winged Olive flies were hatching. I fished a tiny Blue-winged Olive emerger that my friend Dennis tied. Five minutes later, a trout took the fly. After releasing this small (six to nine inches) but feisty fish, another larger fish (10 to 12 inches) hit. By this time, Dennis’ fly looked bedraggled, but I kept casting it. An hour later, a big fish hit. The rod bent, the reel buzzed as the fish took line and the fish zig-zagged across the pool. Mark, an angler nearby, offered to net the fish and called out that it was big, 17 inches long. But before Mark got to it, the fish broke off, taking the fly with it. This surprising good luck is a reminder that it’s always a great idea to fish - - even when the conditions may not seem to be right. The score at the garden is: weeds 6, John 4. After no weeding during two trips, weeds were as tall as the tomato plants. Weeds and animals finished the eggplant, broccoli, Brussels sprouts, many carrots, chard and all but five cornstalks. But tomato plants were so productive that 80 plum tomatoes became sauce. As this photo from Lotfi and Halimah shows, there is a bumper crop of cherry tomatoes. Three peppers were harvested, the sunflowers went wild and some fennel may reach edible size. 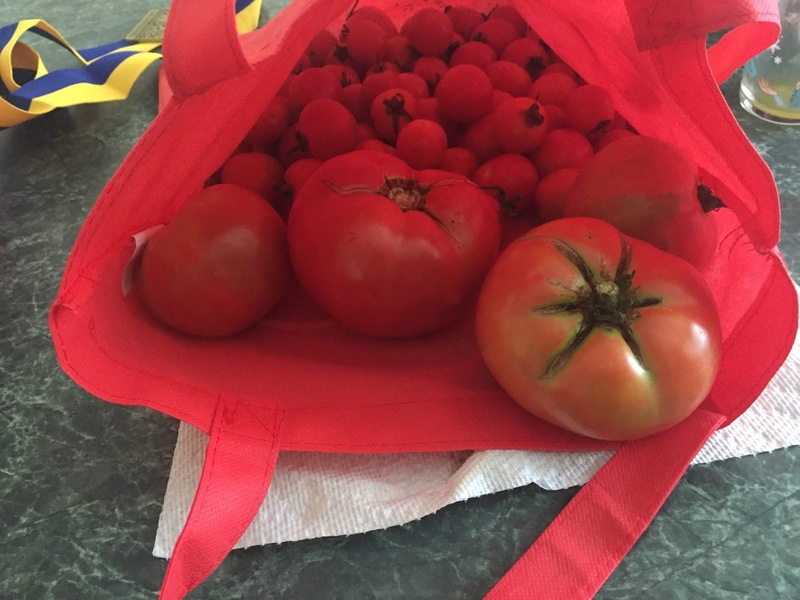 The tomatoes may have been productive because I put down GARD’N Paper, a thick brown paper weed barrier, before planting the tomatoes. The barrier has a useful life of four to six weeks, which enabled the tomatoes to grow above the weeds. The help of family and friends has been the reason for any success of this blog. Dorothy and daughter Lily enjoy exploring and many blog posts were inspired by trips they suggested. Friends have offered many blog ideas and photographs. Thank you, Dennis, Erika, Lotfi, Seth and Steve for your generosity in sharing photographs! Thanks, too, to Bill and Tammy for sharing news about Great Lakes happenings. Many authors and experts helped make posts accurate. Airline staff explained why things happen a certain way when traveling. Researchers and government workers provided information to enlarge our enjoyment of everything from lightning bugs to the sweet corn which is now arriving in markets and at farm stands.